Looking at the issues and challenges associated with father to daughter transitions. Succession is likely to be the topic most frequently discussed in the family business context. It is found that the ideal recipe towards successful succession varies according to family mentality and business structures. While the word succession is typically associated to the passing of the business from father to son, it happens more and more often that businesses are passed on from father to daughter. How are daughters integrated as leaders of a family firm? What do we know about the experiences of daughters, on how they succeed in family firms and the nature of their relationships with their fathers? In their article Dr. Lorna Collins, Director of Family Business Research at Bristol Business School, University of the West of England, UK, and John Tucker, Director of The International Centre for Families in Business, UK, explore the particularities of business succession from father to daughter. The experiences of daughters who succeed their fathers in order to become leaders of the family-owned business have been under investigated by academics. Yet, the role of women in a modern family business has never been more important. As academics we are curious to know about how the succession of daughters takes place and the processes by which daughters of business owners are socialised into the family business. For the past 10 years we have been working with a group of clients composed of fathers and daughters of family firms, whereby the daughters had all succeeded their father as head of the family business. The interviewees came from a variety of business sector backgrounds, including engineering, distribution, leisure, food and beverage, construction, communication, and education. The interviewees spanned second to fifth generation, within an age range of 36-62 years. In all but two of the case studies the father was still alive and in all but one case those fathers still alive had no 'official' role in the business. The business turnovers were between £2m and £45m. The businesses involved would be considered to be profitable and well managed. The research comprised a series of interviews with a small sample of daughters of successor generations in multigenerational firms; in total there were eight case studies, all UK based and run businesses. The sample was drawn from the contact network of the The International Centre for Families in Business and Hazlewoods LLP, Business Advisers and Accountants and was designed to embrace diversity of sector, age of firm and process of succession. The interviews were conducted at the phenomenological level of 'lived experience' (Thompson et al., 1989). In working with this sample we have begun to develop a picture of the ways in which women are integrated into family business leadership roles. We have also learned about the key issues that daughters face when they succeed fathers. This article focuses first on what we know about the early education that daughters receive in their family environment. It then considers the critical incidents, which have shaped their journey to succession. Finally, we consider the issue of how daughters are integrated into the family business and what the nature of the relationship is that exists between father and daughter. 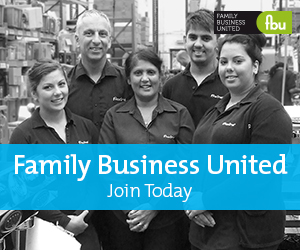 Why the interest in succession experiences of family business daughters? The experience of daughters working with their fathers is a special and particularly interesting subject for a number of reasons. 1. The involvement of the founding generation in the family business is often protracted and overlaps the involvement of younger family members, enabling a range of possible mentoring roles. 2. Younger generations growing up in the family business environment enjoy a lengthy period of socialisation, not only into the family and society but also into business and the specific family enterprise. 3. This socialisation process that the daughter undergoes may occur within an environment where there are powerful and explicit family expectations about future roles in the business and perhaps eventual management succession; on the other hand, these expectations may operate only at the subtle, tacit level or indeed may even be non-existent. There is a striking degree of concordance between the family business daughters in the group we examined with respect to their powerful expression of values when it comes to business management. A major theme is the need for financial prudence, that is, the need to take care with cash and be prudent with the acquisition of assets. Another common theme is customer care; the importance of customer relationships and the effective communication with customers. Survival and continuity is another common theme that the majority of daughters in our group expressed to be of major importance. Many had lived through critical phases in their family businesses where its very survival was threatened. These early educational experiences at the bosom of the family have a significant impact on succession and seem to have a great impact on the nature of relationships that these women developed with their fathers. What are the early operational experiences of daughters? We have seen that from an early age daughters are as involved in the family business as their brothers. Performing low-level operational tasks is common; 'I've been stuffing envelopes since I was a small child' one daughter told us. Most of them worked regularly in the firm when out of school and during school holidays, performing a wide variety of manual and clerical tasks, including posting ledgers and other simple accounting and recording tasks. For some women this practice continued throughout their formal education, and they continued to work in 'the office' during their university vacations. For others education about the business started almost as soon as they could walk. Fathers and grandfathers shared their knowledge about a myriad of business-related realities; cash-flow, profit margins, buying prices, customer care, and even lorry maintenance. Work in the business took place on weekends, alongside siblings and in all sorts of conditions. Experiences of early exposure to the business occurred from just 'being around' the business, to doing easy tasks after school, and to discussing business around the dinner table, taking care of weekend chores, and taking on holiday employment. The daughters in our client group were just as involved as the sons and were treated with equality with respect to working in the business. What did they learn during these early experiences? One of the biggest lessons learned by family business daughters during these early days was about the importance of customer relationships and effective communication. One reported; 'we were taught to answer the 'phone properly from a very early age, 7 or 8, as it could be business'. Experiences were not always positive, as one recalls: 'I remember learning that the customer is king at 10. Dad would put customers before us'. Many were taught to answer the telephone properly, to speak to customers with respect and to hold their own if a customer was 'trying to pull the wool' (being difficult or confrontational). Most daughters became acutely aware of their responsibilities with regard to their role in the family business at an early age. One woman told us that at age eight 'she felt like we were all ambassadors, we carried the flag for the business'. Another reported that every conversation with her father ended up being about the business and those conversations were always all about 'customers, customers, customers, without whom there would be no business.' The importance and value of customers to the business was a very common focus of early learning. What about risk and insecurity? The daughters in our client group were not protected from the challenges and problems of business during their childhood. One daughter told us of a situation when her family business passed through its first major cash flow crisis. It had a major impact on both the women and the family. 'When I was eight, we nearly went under (became insolvent) – fear was dominant in the family'. The tentative and conditional nature of the security of the home was deeply impressed upon her: 'I learned the level of insecurity in starting a business, the risk – the amount you could lose'. Recognising the stress that her parents were under, and wanting to minimise any additional burden that she might impose, her response was to be as self-sufficient as possible, renaming her bedroom her 'flat' and maintaining her own supplies of food and drink. The intensity of responsibility felt by daughters, and indeed by other siblings we have worked with, was, and still is, immense. Preceding generations had experienced times when the survival of the company was in doubt. Each generation is regaled with stories about 'the bad times' and particularly around the dinner table family folklore about 'bad times' are regular parts of the conversation. Each succeeding generation feels the weight of responsibility to ensure the firm survives to pass to the next generation, hence the phrase 'not on our shift'. It is clear that daughters who succeed feel keenly the weight of responsibility for the success of the business. Financial prudence, that is, care with cash and prudence with regard to the acquisition of assets is another early lesson that family business daughters who succeed seem to learn. Experiences of financial crisis have profound effects on the next generation. One woman told us that she feels her early involvement with the business had numerous positive effects. 'I just grew up with a (practical) living, working notion of money and what to do with it and what not to do with it'. At an early age, many family business daughters and siblings were introduced to formal financial planning and expected to apply it to their personal expenses: 'we had a budget when I was 11 or 12 – we had to spreadsheet our expenses. Bottom line was our life'. The making of money, the use of money and the role of money in providing the security that the family needs often features significantly in a daughter's early education. A belief that 'cash-flow is king' is common amongst the daughter client group. Many women had knowledge about the financial management of the company imparted to them at an early age. The finances of the business were a common and persistent topic around the dinner table. The lesson of 'prudence' in such things as cars, holidays, clothes and possessions was frequently encouraged. Many daughters were not paid for their work, as this was seen as their contribution to the common good. Family members are paid a 'fair' wage, but certainly the salaries do not necessarily reflect current reality in the market place. The view that 'you get other rewards through working for the family business' was frequently expressed and both tangible and intangible benefits are provided by the business. A significant theme that emerged during discussions with our family business daughter client group was the notion of 'leaving and coming back'. The action of leaving the family home and as a consequence, leaving the family business was a reoccurring one in daughters' journey to succeed in the family business. Daughters left the family, many doing so to follow an education or career path or a particular personal agenda. Daughters who succeed in family businesses seem to be more inclined to leave the family home and family business to follow their own perceived destiny at quite a young age. Most indicated that at the time of their leaving they had no intention to ever work in the family business. The way in which many daughters came to be 'returned to the family and the business' is quite interesting. In most cases there was a request, a suggestion and enquiry from their father to come back. What is not clear at present and what will be the subject of further research is just who it is that instigates the return, and what is the motivation behind the decision made to return? It appears that in a few cases a daughter would run into financial difficulties and that the father's response and instinct was to protect her. This was an overwhelming driver for instigating a return to the family and to the security of employment in the family business. Most daughters in our client group have expressed the following sentiments; 'my father was never there when I was growing up'; 'he was always working'; 'we only saw him on the weekends.' There is a protective character to the relationship when fathers and daughters work together in the family business after the daughter has succeeded,. We could surmise that this is an attempt by the father to 'make up for lost time,' and overcome feelings of guilt for what was missed during the daughters' childhood. There is much evidence from other studies and research that in later life men who have dedicated their life to a business, once grandchildren arrive on the scene; or at times of serious illness; often reflect on their relationship with their own children and understand just how much they may have missed during their childhood. The women who now work with their father generally describe the opportunity to do so as a privilege and pleasure, and as a positive experience. However, there is a distinct tone within the relationship that both are 'making up for lost time'. What are father/daughter relationships like once the daughter has succeeded? When comparing the relationship between father and son and father and daughter, a common observation is that there is a difference in the nature of its competitiveness. In our client group it has emerged that daughters really do admire, love and respect their fathers, but unlike sons they do not want to be 'like' their fathers nor do they want to be seen to be better or more successful than them. We observed that daughters have a desire to take what is best about their family business and build on the positive foundations laid by the founder. They neither articulated nor exhibited any sense of competition, or wanting to emulate their father. In almost all cases there was a profound sense of responsibility for what had been created (by their father and other predecessors) and a profound sense of duty to protect and sustain what had been passed on for future generations. Fathers frequently fear the failing of their own powers and some may find it difficult to accept that the time has come to hand over the reins of leadership. Often the decision to pass the business to a daughter is delayed beyond an ideal time. Many fathers fear that no-one can replace them and that any replacement will result in losing what has been built. Another common lingering thought that fathers entertain is that the next generation cannot help but be more successful. After all they have spent a lifetime creating, building and nurturing the business, and letting it go is counter to what they have spent their entire life trying to avoid. Plus what they have built is solid and better than what they took over when they succeeded. Often the relationship between father and son seems, for the son, to be built on competition, conflict, ego, and wanting to prove worthy of taking over the mantle. The son often wants to try to be like his father, to be more successful, and prove he can 'do it'. To the successful daughters in our client group, the relationship with their fathers seems to be more about recognising the father's good, positive, and inspirational qualities and about emulating these qualities. Daughters are interested in nurturing the business and ensuring its longevity and from the interviews, it is apparent for our client group that women have a strongly developed sense of duty and responsibility for succession; particularly when their family name is over the door.